Super rare Northern Soul 45 by ERNIE JOHNSON. 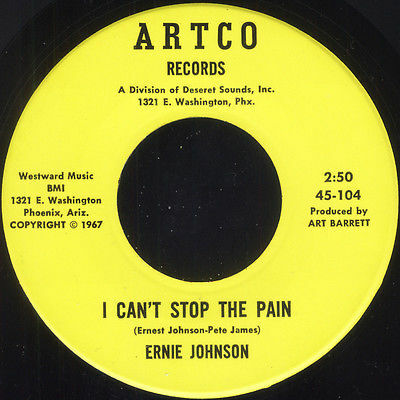 I Can't Stop The Pain / These Very Tender Moments (Artco 104)) The 45 is in Mint condition. I rarely use Mint condition as a grade but this 45 is as good as it gets. YOU WILL NOT FIND A CLEANER COPY! This copy came out of a famous L.A. record label's stock. Only copy that was found. The 45 will be housed in a professional 45 mailer with rigid cardboard on each side of the record. Please wait for me to send you a invoice before paying. Sorry for the new insane international postal rates. The shipping cost is exactly what the Post Office will charge me. Two 45's can be sent for the same price.